I’ve always loved a good romper and I think this summer will be no exception. 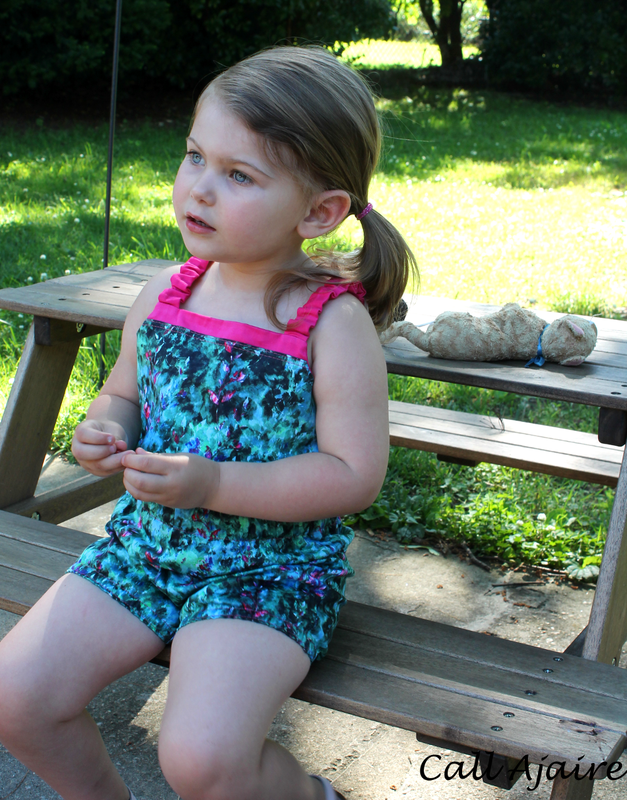 Bean is now three years old and potty trained so a romper can be tricky when she’s asking to do everything herself. I set in to designing a romper that she could be comfortable in and both dress and undress without my help. RaeAnna invited me to be a part of her fun Romper Week so I jumped at the excuse to design the romper I’d been planning in my head for the summer. It’s a fairly simple style which is perfect for showing of a lovely fabric. The fabric I used is a sateen from JoAnn that I’ve had in my stash since the late fall I think. The pop of pink sateen at the top is leftover red sateen that I bleach dyed as part of my project run & play week 2 look which ended up being too pink for what I was going for at the time, but I’ve used it a bunch in other projects lately. It’s a really great pink. Once again I digitally drafted this romper using Inkscape. This was made using the first (and only so far) print out of my pattern pieces so it’s essentially a wearable muslin. Super wearable. It’s exactly what I was going for. 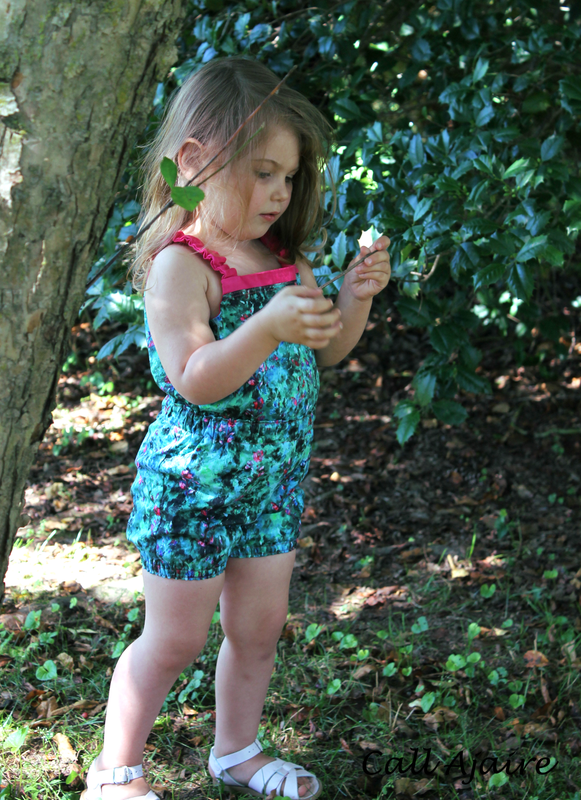 A bit more of a sunsuit than a romper, but I love those short elastic band leg openings. The straps are elastic with ruched fabric tubes so it is easy on and off. Bean figured out right away that it’s as simple as taking off a swimsuit so potty breaks have been a breeze. My favorite design element is the strip at the top front and back bodice which allows for a great fabric pairing moment. I love how the bright pink helps to make this gorgeous print stand out even more. As crazy as it sounds I think that without the pink, a romper made exclusively with this print may have been too washed out or not as noticeable. Overall, I’m so happy with how this romper turned out. I have some other leg band ideas so I may make a few more. I whipped this one up in less than two hours one morning before everyone woke up so it’s a relatively quick sew. Thanks to RaeAnna for giving me the perfect excuse to make a new romper! You can read RaeAnna’s introduction post here which has the link up party and all the information about the giveaway! You can also follow Sewing Mama RaeAnna’s board Romper Week – Sewing Mama RaeAnna on Pinterest and don’t forget to enter the giveaway below. It is so cute. I love the pop of color. Both fabrics look fabulous with her coloring. I never noticed how bright blue her eyes are before this. We are so early into the potty training stages with Boston that if it takes more than a second we might have a problem. But it is good to know eventually we could come back to rompers. i super heart rompers, so so cute! Adorable!! I was wondering what it was going to be after the sneak peek on Instagram! Very cute and the fabric is so pretty. The elastic on the straps was a clever idea. My g. will be 3 by the end of the month too and she's potty trained as well. She hasn't been wearing that many rompers lately because of that, but I think the one I did works well too. i haven't had her taking it off by herself yet, don't know if she'll be able to. so adorable! I love that fabric combo. Cute! I'm drawing a romper as well now, guess it's really trending 🙂 And love the pink, it indeed picks up the fabric. Great combo and fabulous pattern! Can't get enough of the colors! Really cute! She's getting to be such a big girl! I think this style would work really nicely for potty trips, you're right I never thought about the fact mine can work her way in and out of a swimsuit why not this. LOVE this!!! That swimsuit is just darling! Yeah last summer we were training and it was crazy getting ties untied in time 🙂 These straps are super easy! Nienke they are so in this summer again! I was worried everyone would be sick of them this year, but they're still popping up everywhere. I love it! Yeah I really love that fabric with the pink. Love this one! And love that you drafted it. We had an emergency call for help last week from the bathroom when my Peanut couldn't figure out how to get her romper off. I'm noting the elastic shoulder straps for our future rompers. Thanks for linking up with Inspire Us Thursdays!